As a general rule, I’m not a big fan of messenger-style bags—I’m a backpack guy. Besides preferring the ergonomics of a good backpack, I find that many a messenger bag is too floppy (that’s a technical term, folks), which makes it a hassle to access the bag’s contents, and the bag falls over when you set it down. Some leather messenger bags get around the latter problem, but leather is heavy, which usually means even worse ergonomics. Rickshaw Bagworks’ Commuter line of messenger bags doesn’t work miracles in terms of back/shoulder ergonomics, but the two bags in the line, the $180 Commuter 2.1 Laptop Bag and the $100 Mini Commuter Bag, are otherwise fantastic. Unless you need the boardroom-leather look, these are my current go-to recommendations for people looking for a one-shoulder tote, and they still look good enough for casual business settings. Rickshaw’s factory is located right here in San Francisco, and each bag is made on demand. The company says it was inspired by the city’s bike and commuter culture; the most obvious manifestations of this inspiration are messenger-style designs and bags that are waterproof with easy-to-clean, PVC-free liners. But with the Commuter, Rickshaw has taken the messenger design—the company also sells traditional messengers—and made it more practical for those of us who don’t deliver by bicycle for a living. For starters, the Commuter line stands out by standing up. Each bag features a semi-rigid internal frame, so that when you set the bag down on a desk, a table, or the ground, the bag stays upright. Unless the bag’s contents are concentrated mostly in the front or the back, this design is quite stable, but the bag isn’t so stiff that it won’t compress when you need it to. The Commuter bags are also lightly padded on the front, back, and bottom (in addition to any internal sleeve, as described below), which helps with this stability, protects the bag’s contents, and makes the bag a bit more comfortable against your body than many messengers I’ve tested. This design also makes the Commuter a bit heavier than a traditional messenger of the same size, but not exceptionally so—and in my opinion, it’s a worthy tradeoff. The company offers both the 2.1 and the Mini in three different materials. All models use Cordura—“classic backpack fabric”—for the body of the bag; the Classic Cordura models also use this material for the bag’s top flap. The Performance Tweed models feature a top flap made of recycled, stain-resistant polyester woven to look like woolen tweed. (The Cordura and Performance Tweed fabrics are woven in the U.S.) The X-Pac Sailcloth models use a material originally made, the company says, for “sailcloth for ocean–going racing boats.” This material is waterproof and more abrasion resistant while also being lighter than Cordura or Performance Tweed. I’m partial to Performance Tweed, which I think looks great. Sailcloth is quite rugged, and has a nice “technical” look, though it also shows creases more readily, as you can see in the image above. The “silencer” strips use magnets to avoid Velcro noise. Each bag sports a thickly padded, comfortable handle that’s positioned near the rear, so you can pick up the bag even if the top flap is open. Each also includes a wide, removable shoulder strap with a well-padded, removable strap pad; on the Commuter 2.1, that strap includes a quick-adjust buckle positioned on its own strap pad, so the quick-adjust buckle doesn’t dig into your body during your commute. The 2.1 also includes D-rings on the back, sides, and strap for attaching an optional cross strap. Finally, while many messenger bags hide their compartments for pens, phones, and other small items either inside the main bag compartment or under the main flap—making it, again, a bit of a hassle to access those items—Rickshaw puts those organizational areas on the outside of the bag. Specifically, a zippered panel on the back of the bag, closest to your body, accommodates documents and includes slip pockets for your phone, pens, and other quick-access items. On both sizes, the hardware—zippers, shoulder-strap clips, keyring clips, and the like—are sturdy and easy to use; and the zippers use rugged, nylon pulls. The differences between the 2.1 and the Mini, apart from a couple things I’ve already mentioned, come down to bag size and what you can carry inside. The Commuter 2.1 is the larger of the two bags, at roughly 16 inches across, 11.5 inches tall, and 6 inches thick when empty; it weighs just over 3 pounds including its strap. 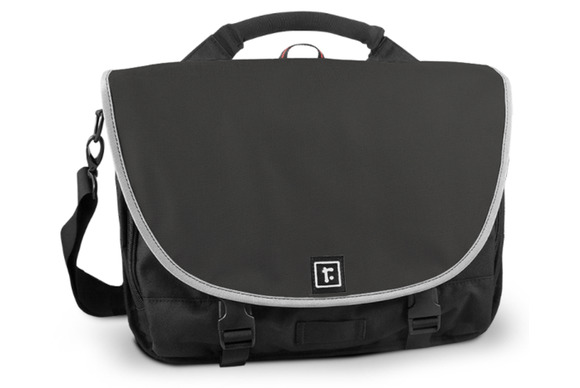 It includes a removable padded sleeve—which attaches to the bag using Velcro—that can accommodate a 15-inch laptop. The sleeve is open at the top, but secures your laptop with a wide, nylon-and-Velcro strap. Even with a 15-inch MacBook Pro in the sleeve, the main compartment of the bag provides quite a bit of additional storage space: roughly 15 inches across, 10 inches deep, and 3 inches front to back. At the front of that compartment is a slip pocket for documents or a few magazines. On the front of the bag, under the main flap, are two large, zippered pockets, roughly 9 inches tall and 7.5 inches across. Each includes a full-width slip pocket on the front and the back (for a total of four), as well as a metal key-ring clip. The front of the bag also hosts five nylon loops under the main flap for attaching gear, as well as a loop near the bottom of the bag for attaching a light when riding or walking at night. On each side of the bag is a small pocket (6 inches tall by 4 inches wide) with a nylon-and-Velcro strap to secure the contents. Unfortunately, these pockets aren’t big enough for a water bottle; each does fit the smallest of portable umbrellas, but only if the umbrella is relatively short. The Commuter 2.1 also sports an additional layer of rubberized waterproofing on the bottom, as well as the quick-adjust shoulder-strap buckle I mentioned above. I mentioned the back pocket’s organizational options; on the Commuter 2.1, this area also includes a clear-window slot for business cards, as well as a slip pocket that fits an iPad mini or a paperback book. You can customize the Commuter 2.1’s colors and materials. The other option unique to the Commuter 2.1 is customization. For the same price as one of Rickshaw’s stock designs, you can create your own bag, choosing from among a slew of colors: 49 for the Cordura top flap; 13 for Performance Tweed; or 7 for X-Pac Sailcloth. You also get your choice of 49 colors for the bag’s binding, and you can even choose one of 17 colors for the Rickshaw Bagworks logo. My only real beefs with the 2.1 are the aforementioned lack of a dedicated water-bottle compartment and—as a MacBook Air user—the lack of a 13-inch or 11-inch version. It would also be great, when customizing the Commuter 2.1, if you could choose a different color of Cordura for the body of the bag—your options are limited to black, black, or black. If, like me, most of your portable life revolves around an iPad or camera gear, rather than a laptop, the Mini Commuter is for you. At just 11.5 inches wide, 9 inches tall, and 5 inches deep, it’s a perfect fit for a full-size iPad (along with an iPad keyboard), or a DSLR and a spare lens—though it doesn’t include a padded sleeve for either. (My guess is that the company assumes—likely correctly—that most iPad users will have their own protective case. Combined with the padded frame, my encased iPad felt pretty safe inside.) The Mini Commuter weighs 1.6 pounds when empty, and, as the company points out, fits nicely in a bike basket. The front of the Mini hosts a single, full-width zippered pocket; inside that pocket are a number of organizational options. Closer to the front of the bag is a large, zippered pocket; on the opposite side is a large slip pocket, along with two smaller slip pockets for pens, another for a phone or similarly sized item, and a clear slot for business cards or ID. There’s also a keyring clip on a nylon strap. If you need more pockets, you can opt for an zippered pouch that attaches to the back wall of the main compartment. The Mini Commuter also has a small pocket on each end, though these are obviously smaller than on the 2.1, and neither sports the 2.1’s nylon-and-Velcro strap. As with the 2.1, I wish the Mini Commuter had a dedicated water-bottle compartment. But it’s a great tote for people who, like me, often bring just an iPad, an iPad keyboard, some books or magazines, and other small gear, and thus don’t need a laptop-sized bag.